With its rolling countrysides, vast history and beautiful coastlines, England is a beautiful go-to place for a relaxing summer getaway. 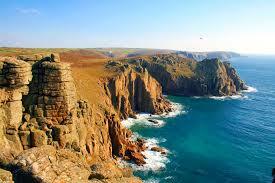 Cornwall, in particular is highly noteworthy especially for those wishing to camp. Located on the south-western most part of England, it is home to golden beaches, , dark green and red cliffs and to the sunniest climate in England. There is no shortage of history in this breathtaking peninsula as its lost ancient ruins date back to the Bronze Age, and include castles, manor houses with grandeur gardens and mines. Perran Springs Holiday Park is definitely my must stay campsite for family camping with the kids in Cornwall,- it’s beautifully located, works as a fantastic fishing holiday with its many fishing lakes, and is full of fantastic wildlife, nature interests and amenities. Perran Springs Holiday Park, Cornwall prides itself on twenty one acres of countryside valley, with the golden Perranporth Beach a mere two and a half miles away and with camping pitches, touring pitches, motorhome units, holiday homes, eurotents and even glamping pods are all available. The site is so well sheltered that it feels like an imagined land. There is so much to explore, with a grassy nature trail located amongst meadowland, marshland, open water, wooded area and hedgerows. In this haven of land, you’ll discover all sorts of wildlife, including is badgers, foxes, bats, kingfishers, owls, and jay. The butterfly, bug and bee garden sees a variety of beautiful flora develop over different times of the year, and there are even feeding stations, ladybird and lacewig houses, a beehive and so much more to explore- a popular hit with the little ones! If your kids are still pining for more adventure after all that, a Play Area and Fox Recreation Meadow will simply complete their stay. For parents, the relaxing Lake Meadow for a beautiful evening stroll has to be recommended. In terms of amenities, you’ll also find everything you need during your stay, including a laundrette, baby changing room, chemical toilet disposal point and outdoor wetsuit washing area. The holiday park shop stocks all daily essentials as well as all your camping and fishing requirements. The private, centrally heated shower blocks are incredibly clean and luxurious, and Perran Sprigs holds fame for a “Loo of the Year” award, amongst many others! For Perranporth Beach, lifeguards operate during the summer months and there are bathing and surfing areas you can enjoy. The local shopping street is a fantastic spot for purchasing souvenirs or simply wandering about, as there are many restaurants, cafes, pubs to try out. There are beautiful sand dunes lining the area with a Golf Club at the summit sporting some beautiful views. The site is located on the boundary of the village Goonhavern, which also hosts numerous cafes, restaurants, pubs, shops, and spectacular views. Here, you’ll find the best in Cornish food, pastries and ales! This entry was posted in Family and tagged Campsite, family, Holiday.